The Dissension hail from Michigan and are part of the expansive From The Depths Entertainment roster. Imperium is their debut EP, having initially been released back in 2011. This six-piece have steadily been making a name for themselves in the US, but sharing stages with modern metal greats like As Blood Runs Black and Winds Of Plague. The Dissension kick off Imperium with the track Cosmic Ultimatum. It's immediately apparent that these guys are aiming at the heavier end of modern metal. The intro is filled with a low, continuous grinding beatdown and is punctuated by low, deathly vocals. It's instantly moshable and probably stokes up a mighty pit live. There's hints modern groove amongst the brutality and I can see why they've played with bands like Winds Of Plague. They do throw in more melodic riffage, to help break up the low chugging guitar and this works well alongside the vocals. There is a good, subtle hint of technicality nestling in the music too, although some people may be put off by the overuse of that breakdown.The dual high/low vocals work well though and the pinch harmonics add some skill to their barrage. Prolific Con follows in similar fashion, but the single plucked bass at the start is a nice touch. This song is more groovy than Cosmic Ultimatum and it sees The Dissension settling down into a more relaxed and skilled playing style. The reliance on the breakdown is not as present and you begin to see their death metal influences coming to the fore, especially in the deathly growls. I'll be honest, I've not reviewed anything with this kind of modern chug sound for a little while, so in it's context it's pretty refreshing and their are some great parts to their sound. Downfall has more of a militaristic sound. It's still crashing in it's delivery and the modern production helps the music to come across well. Tyrant (Words Mean Nothing) is their most epic song, weighing in at just over seven minutes and early impressions are good, thanks to the dramatic guitar intro. Once over, The Dissension slip back into groove metal mode. The inclusion of clean singing here though, shows a new side to their sound and actually adds to the music. It's not over the top of cheesy, it just fits in well. There's more of a reliance on good instrumentation here, so while the main rhythm section stays on point, some really good lead guitar work adds colour and variation to their sound. EP closer, Scourge of The Earth is probably the most technical song on the EP, if the intro is any thing to go by. The guitar is jazzy and pretty maddening in parts. This shows The Dissension in more assured form. The sound hear is pretty huge thanks to the production again. The introspective section midway through is a nice touch, especially with subtle jazzy flourishes. They close things out in pure thrashing style, with a last passage of headbanging fury. Overall, this is a great debut EP from a band who are making all the right noises. While it may not challenge the uber kvlt listeners amongst you, it certainly does no wrong. I'm looking forward to seeing how The Dissension progress and grow as time passes. If they focus more on the technicality and less on the breakdowns, they'll fit in alongside many of the modern metal greats! 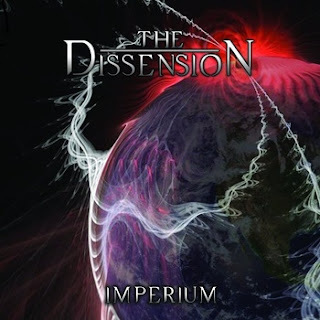 href="http://thedissension.bandcamp.com/album/imperium">Imperium by The Dissension As a way of spreading their band's music around, From The Depths Entertainment offers the majority of it for free download here - http://ge.tt/6Fb73ki. The Dissension can be found at http://www.facebook.com/TheDissension.